Did you find anything in your mailbox last week? Lovely mailbox. The Willig book caught my eye immediately! Very nice reads! I like how one publisher puts release dates on the spine – perfect for picking the next book. Cute notepad. Enjoy your new books! The Emma Straub book sounds very interesting. She is an author on my to-read list. Enjoy your books! Have a wonderful time with your mom. Looks like you received some good books last week! Enjoy your mom time…that is so special! 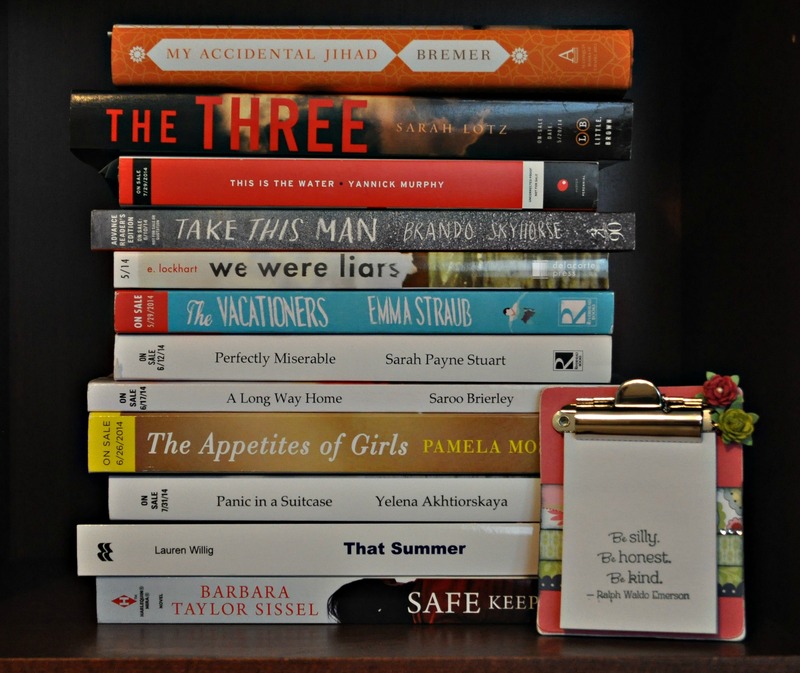 Enjoy your books…you have a lot of memoir to get through! Have a great time with your mom. Looking forward to the Lauren Willig book. A couple of others caught my eye too. Amazingly, none of these are familiar to me! Now that is an amazing week of books coming in. I love the title Panic in a Suitcase, going to check that out now. The Accidental Jihad sounds like I need to read it. I can see that happening, we are so multi cultural in our world. Amazing, all these titles are unfamiliar to me. I don’t get ARCs or any books in the mail unless I order them. That is OK, because I can’t seem to get through the ones already on my shelf. Panic in a Suitcase, We Were Liars, and Take This Man all look amazing. Hope you enjoy your books. I’m not familiar with any of these. Glad you got the notepad 🙂 Enjoy your time with mom! What a stack! Happy reading! I heard positive things about We Were Liars. Enjoy your week. Wow that’s a lot of books. How do you pick what you’re going to read? And if you aren’t going to read some, do you let the publisher know? Wow .. that’s a big mailbox. Many of the titles are new to me. Have fun with your sweet mama! Great haul of books. Enjoy! Enjoy your visit with your mom! Good idea to take an internet break. We were Liars is a book I hope to fit in very soon. The Vacationers looks like a fun beach read! That clipboard magnet is super cute. I also received Accidental Jihad! Happy reading and enjoy your visit with mom. Lovely books! I can’t wait to read The Accidental Jihad, and the author will be at Booktopia. A great mailbox for you, enjoy! your time with your mom. Wow these look good! Enjoy. Great mailbox, The Vacationers catches my eye. Have fun by your moms. All but one is new to me. I hope you and your mom have a great time together! Amazing mailbox as always. ENJOY!! Oh my goodness! You have a fantastic mailbox! You got a lot of books on Tuesday! Sounds like a good selection of books. And I love that clipboard magnet. Cute! WOW, awesome –many of the Penguin ones look awesome. Nice week. We even have a few of the same books. And have a great time with mom. I am currently reading SAFE KEEPING and enjoying it. I just love her books!!! Nice mailbox! Enjoy! I recently got approved for Appetites of Girls and My Accidental Jihad on Netgalley. They look great! Enjoy the week! Love that notepad! I received My Accidental Jihad this week–for the first time in almost 7 years I’m starting to receive unsolicited ARCs and I can’t figure out why! And I’m not really sure what to do with the ones I’m not interested in reading. What do you do with the ones you don’t have time for? You sure are getting some great books lately!